Some exterior lights flash, all the doors and fuel fill door lock, and the security system sets. The beeper sounds and verifies the security system is set. The remote transmitter will not work when the key is in the ignition switch. 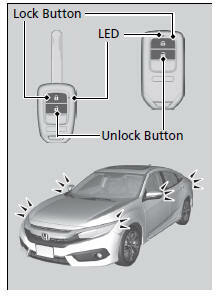 You can lock or unlock doors using the remote transmitter only when the power mode is in VEHICLE OFF. Some exterior lights flash twice, and the driver’s door and fuel fill door unlock. If the distance at which the remote transmitter works varies, the battery is probably low.